Item is a photograph of photographer A. MacNeil documenting burial #4. 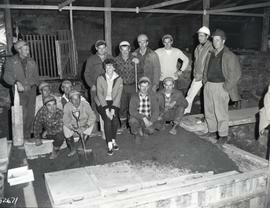 Item is a photograph of the archaeological labourers in the King's Bastion chapel. Item is a photograph of burial #1 in the King's Bastion Chapel. Item is a photograph of Burial #1 under the King's Bastion Chapel. Item is a photograph of a Site Assistant working on burial #1. Item is a photograph of the top half of burial #1 in the King's Bastion Chapel, facing South. Item is a photograph of burial #2 in the King's Bastion Chapel. Item is a photograph of the concrete lid of the coffin for burial #2. Item is a photograph of Burial #3 under the King's Bastion Chapel. Item is a photograph of burial #3 in the King's Bastion Chapel. Item is a photograph of burial #4 in the King's Bastion Chapel.